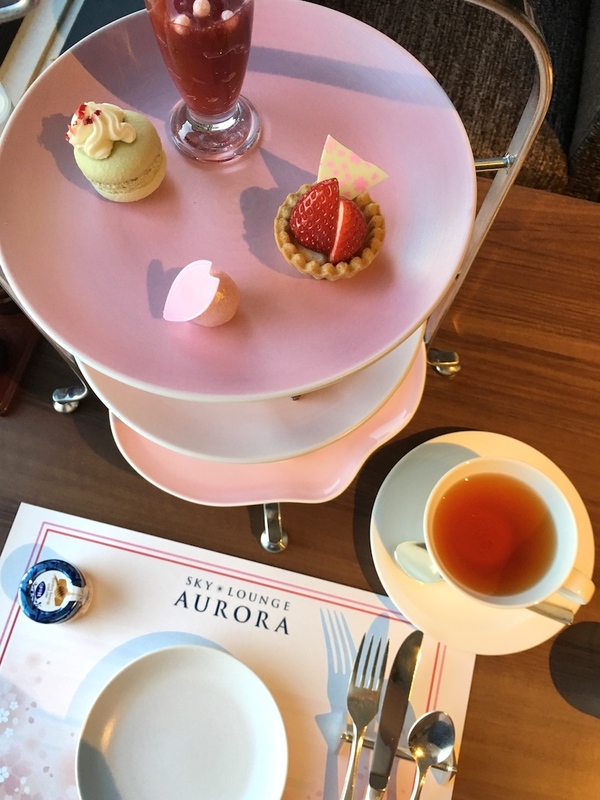 I didn’t plan on having afternoon tea during my short trip to Tokyo, mostly because I didn’t think I’d have time. 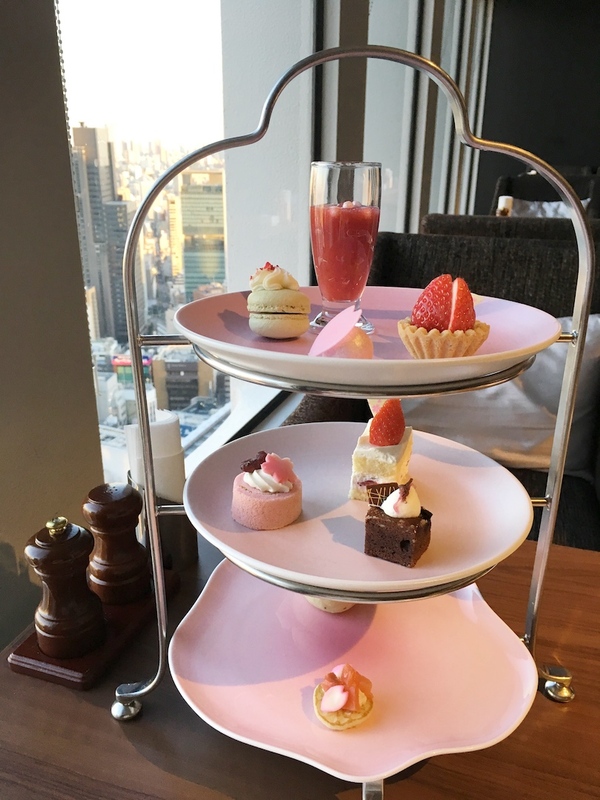 But I found out the hotel I was staying at, Keio Plaza Hotel Tokyo served afternoon tea, so I decided to take the chance to have an afternoon tea experience in yet another country! Keio Plaza Hotel Tokyo is located in the Shinjuku area of Tokyo. There are a ton of office buildings in the area, including a government building right next door to the hotel. The hotel is also a few minutes walk away from the train station which will give you easy access to the rest of the city. 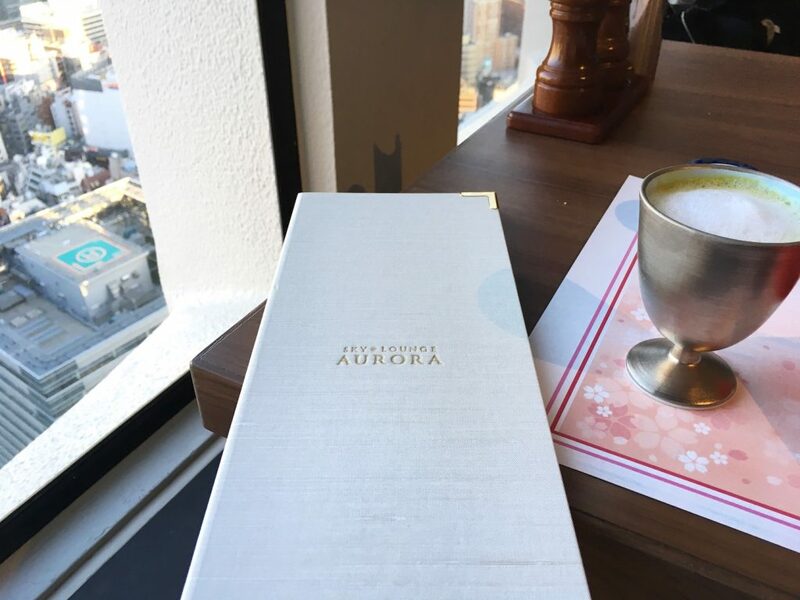 What makes afternoon tea at Keio Plaza’s Aurora Sky Lounge on the 45th floor of the hotel special is the view. 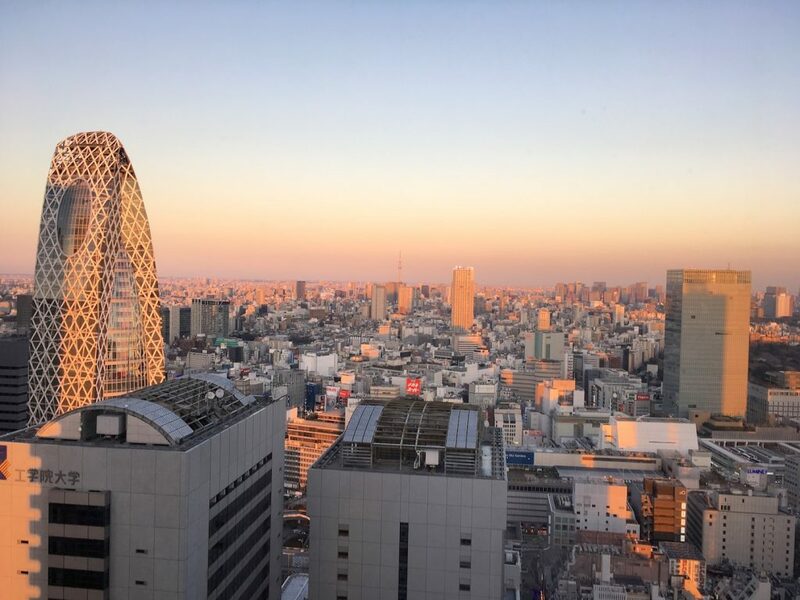 I was staying at this hotel during my visit to Tokyo and wanted to check out different parts of the hotel. 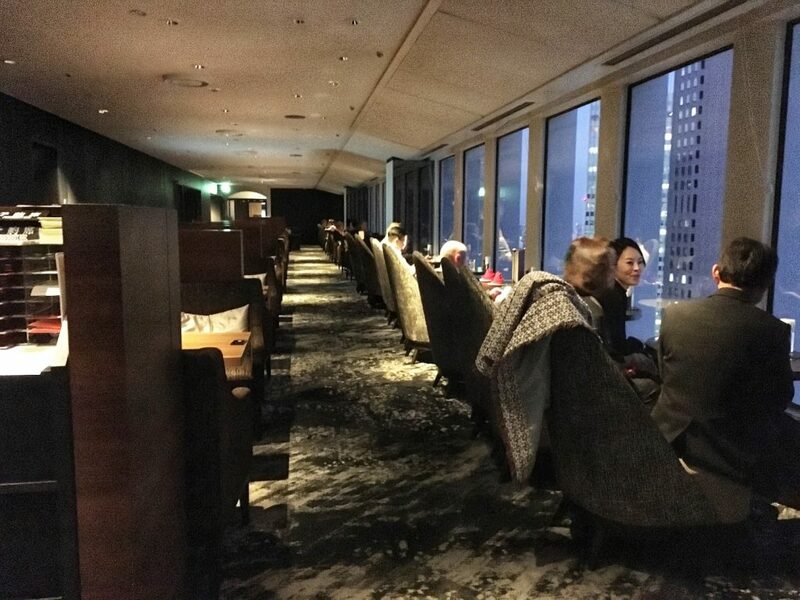 There’s about 10 restaurants around the hotel, one of which is the Aurora Sky Lounge. Most of the seats are facing the windows, which the seats are actually positioned in a way so that the person sitting will be ‘forced’ to look outside. 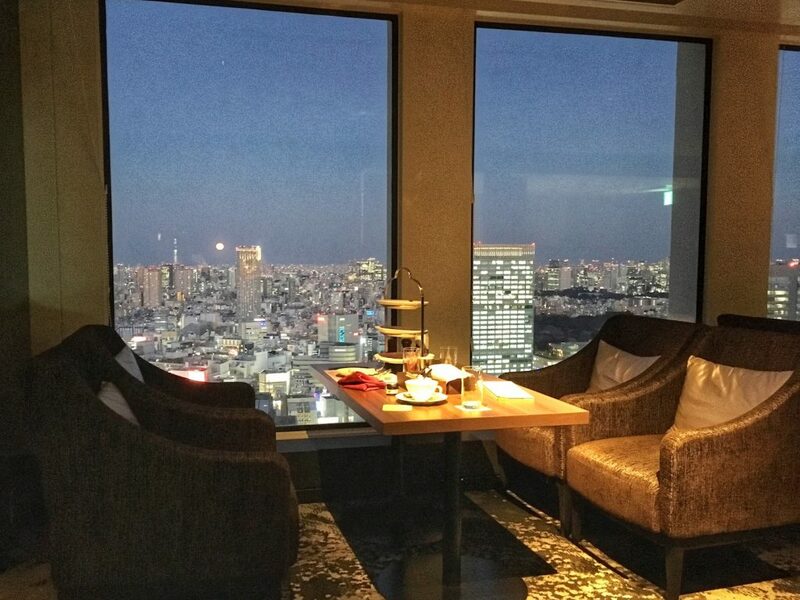 It’s a sight you don’t want to miss for a view of the Tokyo skyline. 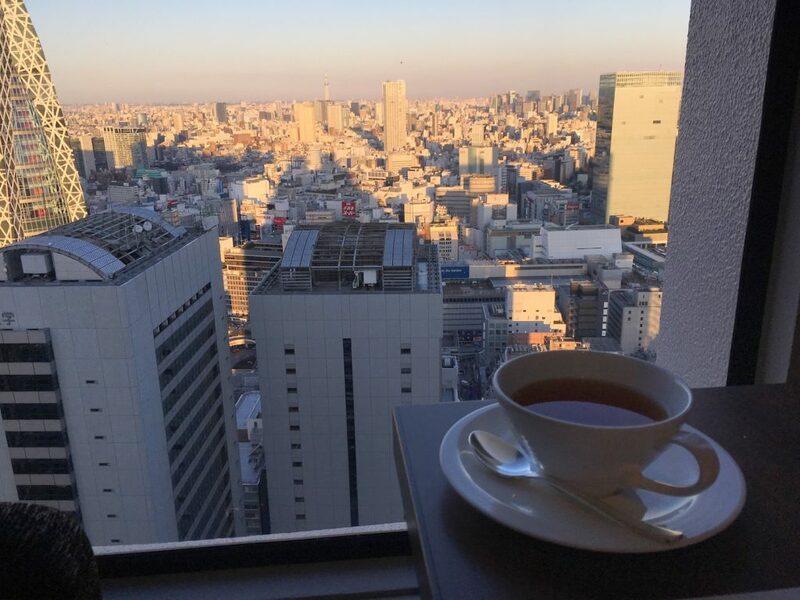 I had tea later in the day, so I got to see the view during the afternoon right before the sun set, during sunset and after when all the lights of the city turn on. You could even see the Tokyo Tower. 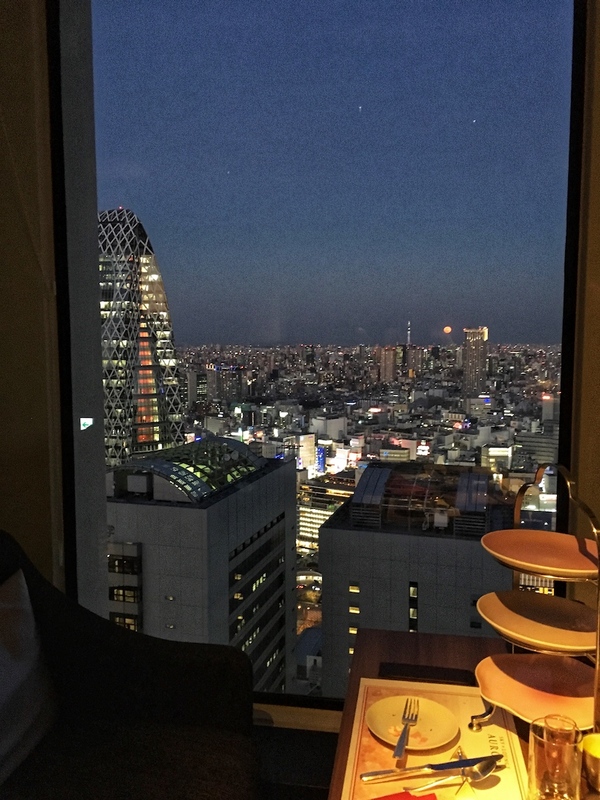 And the moon was so large, you can see the circle by the Tokyo Tower in my pic above. As for the ambience, when I arrived, there were several groups of ladies having afternoon tea at the window seats. The side that they were on closer inside the lounge was all filled up (and probably reserved in advance). But I had a pretty good view from where I was at the windows towards the entrance of the lounge. 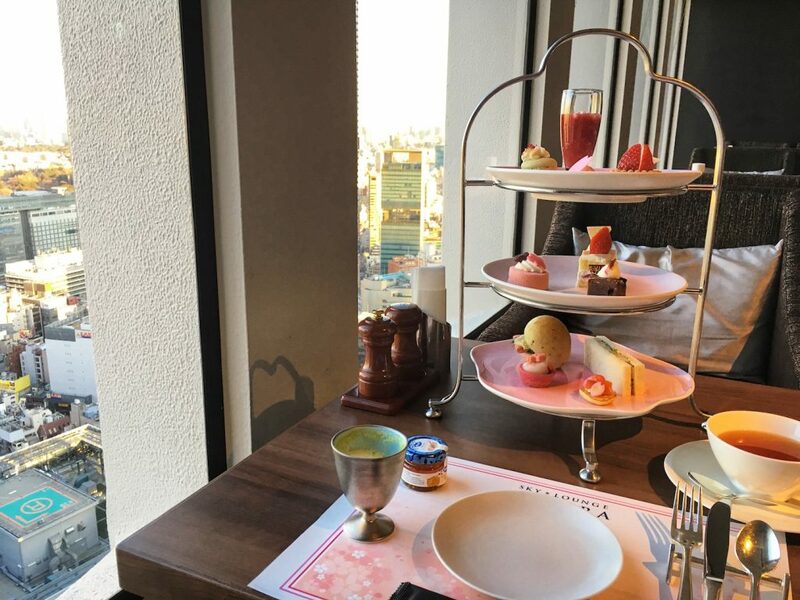 There’s a selection of the usual teas you’d find at any afternoon tea around the world like earl grey, Darjeeling, herbal teas and decaf teas too. However, the tea menu also had several Japanese teas and a special tea, blended just for the hotel. It is, of course, what I got since you could only have it at this hotel and no where else. 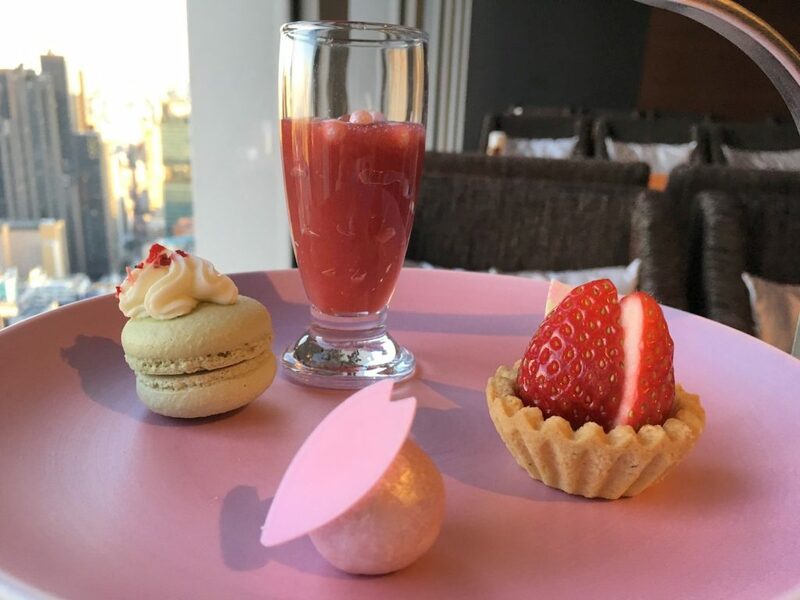 Keio Plaza Hotel offers one afternoon tea package. 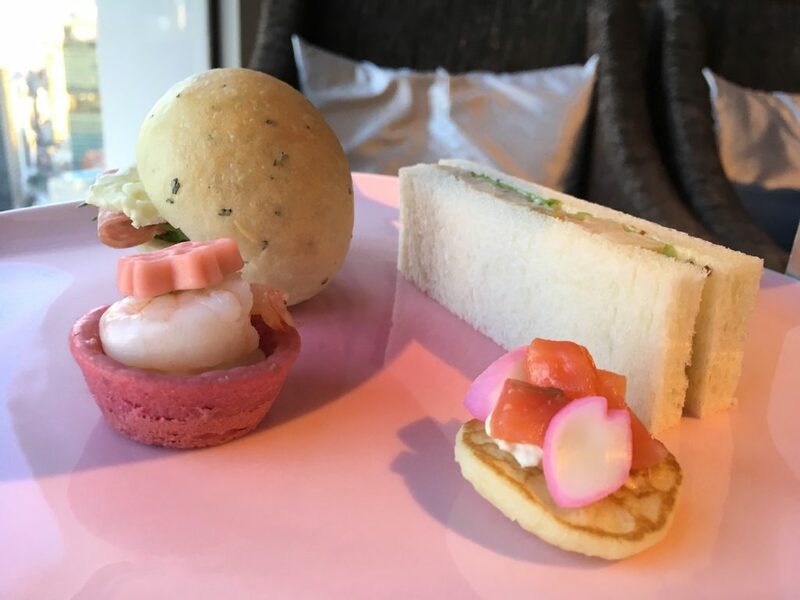 This review shows the afternoon tea package for one person. 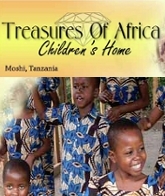 In the above picture you’ll see a silver chalice type cup. 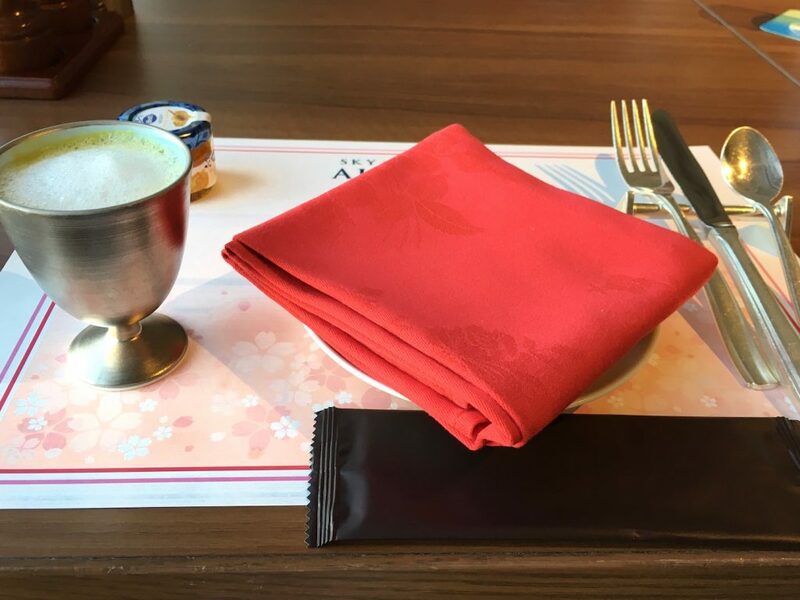 After I ordered the afternoon tea package, even before the tea came, I was given the cup which was filled with a green liquid. It was warm and appeared to be a type of creamy vegetable soup. On the savory plate, there was some sort of classic items like the smoked salmon pieces on a small piece of bread. 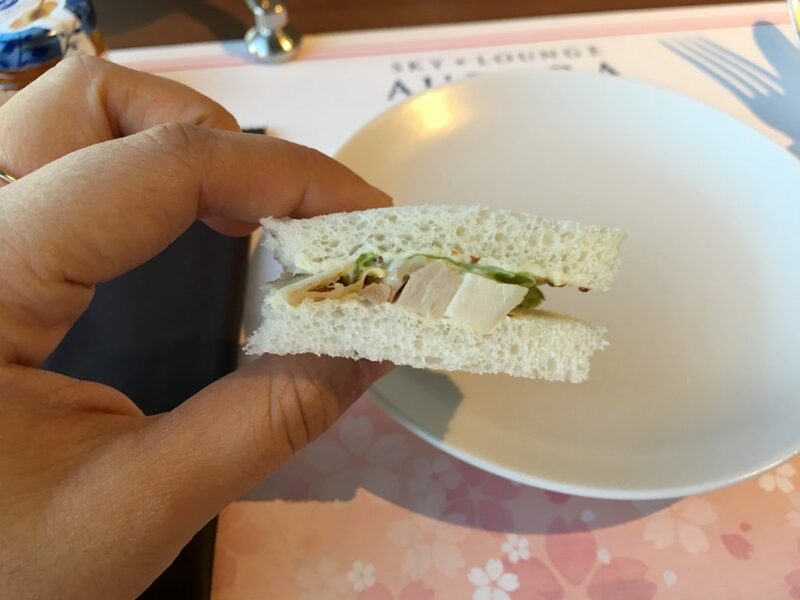 Also, there was a sandwich with brie and salami, a shrimp tarlet and one tea sandwich with chicken, mayonnaise and lettuce. All the items tended to have a little bit of pink in way or another. 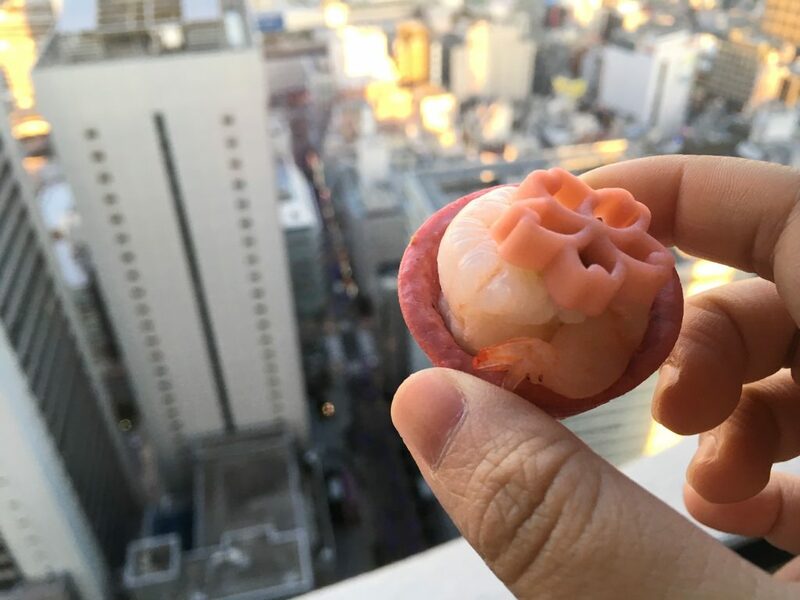 The shrimp tartlet’s topping was a pink flower shaped pasta. The scones arrived at least 45 minutes after the afternoon tea tray arrived with the sweets and savories, which isn’t something that usually happens at afternoon teas. 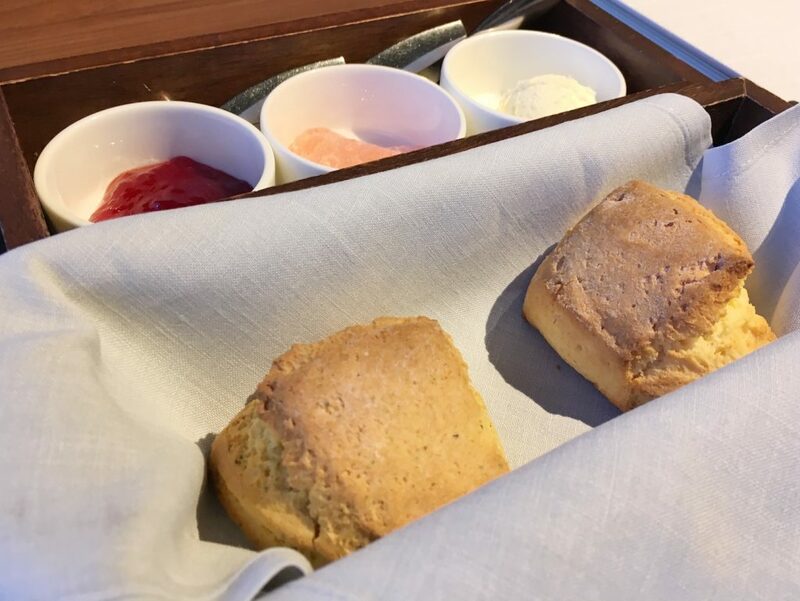 I almost thought the afternoon tea package didn’t come with scones. 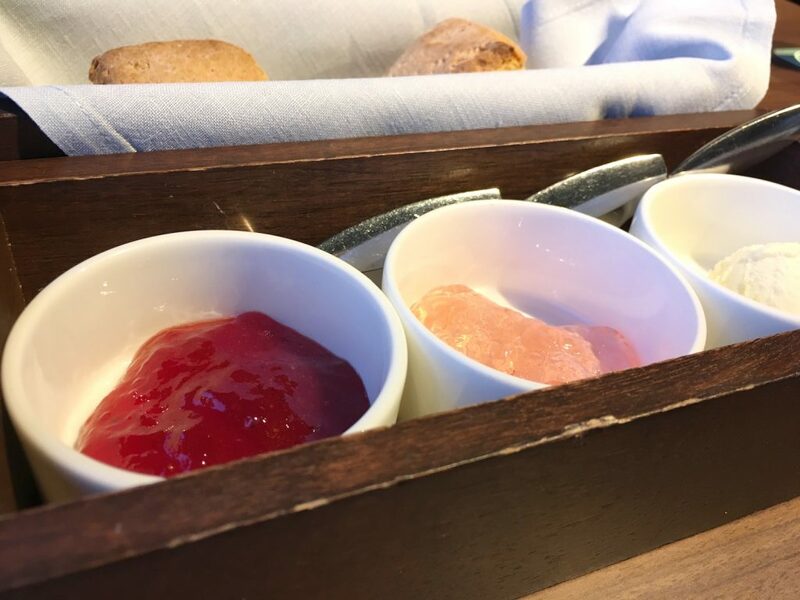 Two scones arrived warm in a box along with cream and two flavors of jam, strawberry and one that had some sort of rose flavoring. 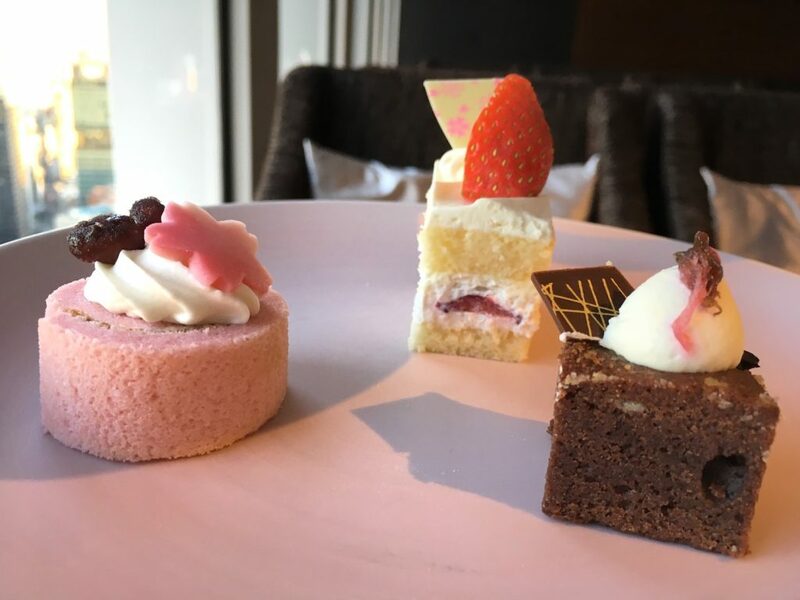 Two plates of the three tiered afternoon tea tray were desserts. Included were a macaron, strawberry tart, chocolate truffle, a type of strawberry jello, and three cakes. What’s interesting about these desserts is how light they were. I find that Asian cakes tend to be very light and fluffy. So eating a bunch doesn’t feel like eating that much. Also, from walking around Tokyo, I found strawberries are really expensive. 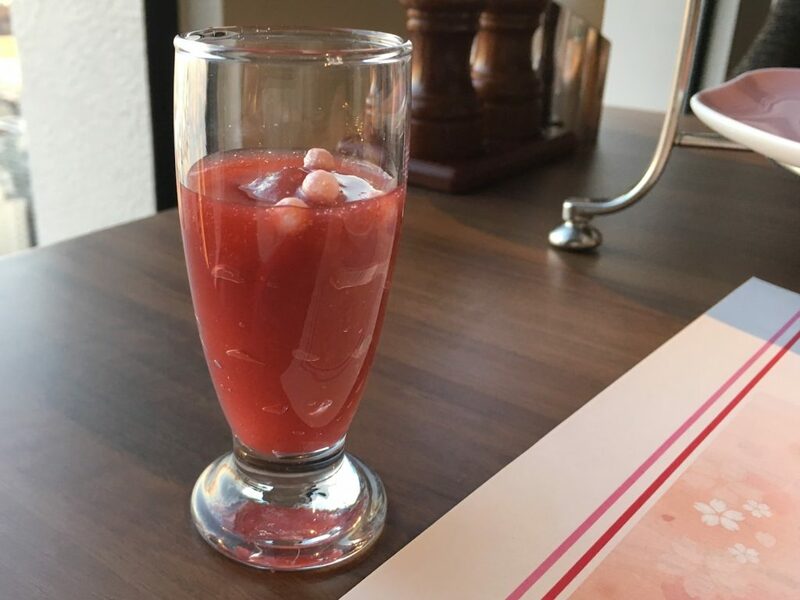 So finding fresh strawberries and strawberry flavors throughout the afternoon tea is probably a treat for locals. Upon ordering the afternoon tea, a server came with a pink paper place mat. He proceeded to add a tiny white plate and a stand for my cutlery. And one thing that I noticed during my trip to Japan was the wet cloth. You’d be given one before every meal to clean your hands. At afternoon tea was no different. I feel like though the staff speak English, they didn’t really understand what I was trying to ask most of the time. Service was slow. Especially since I got my scones when I was almost done with the sweets and savories. Also, I was not offered more hot water for tea. WiFi is available for free at Keio Plaza Hotel. I was already connected since I was staying at the hotel. But as with most hotels around the world, if you are not staying at the hotel, you can ask and most of the time a server can give you a code to use. 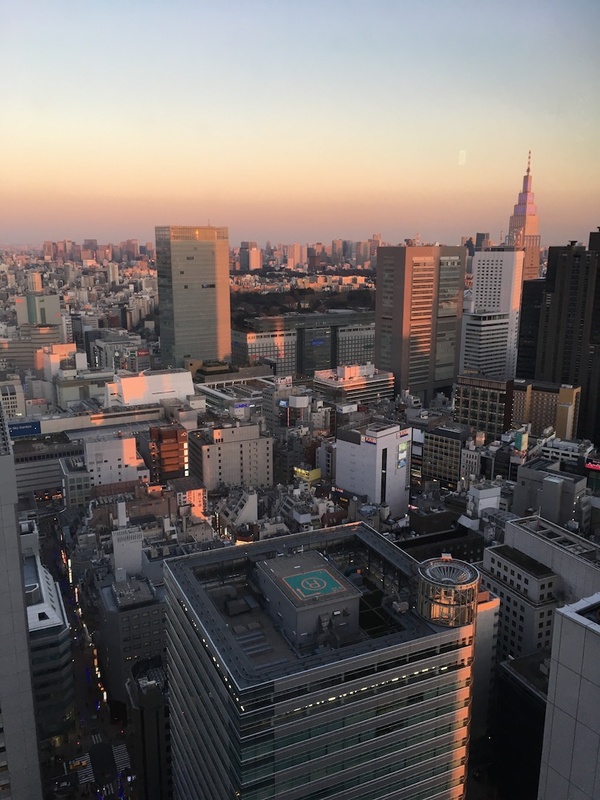 Keio Plaza Hotel is active on Facebook and Instagram. They post updates and news pertaining to things going on around the hotel. It was interesting to have afternoon tea in a country I hadn’t been to before. I did like that the desserts were very light in the sense that the cakes were more like sponge cakes and that the whole afternoon tea had an Asian twist. 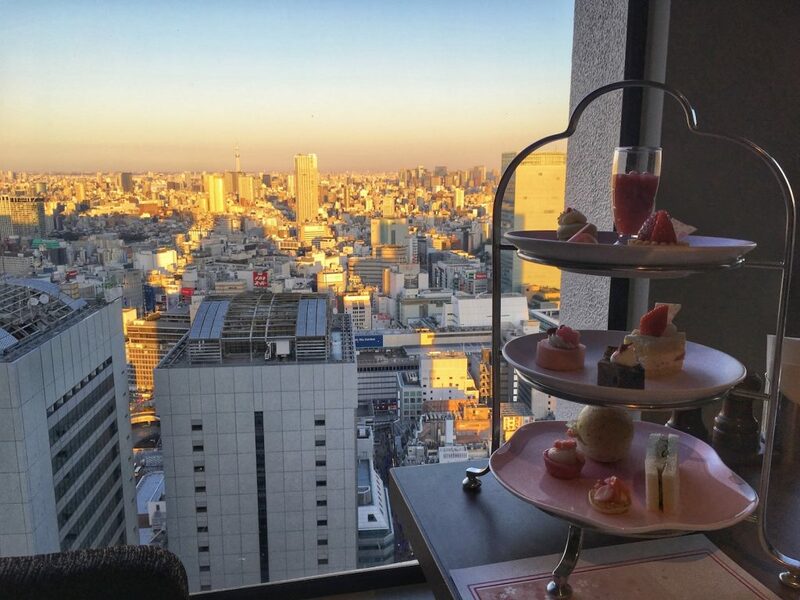 Bottom line is if you want to try afternoon tea in Japan and want a place for a view of Tokyo, especially during sunset, this could be an option. However, from my experience staying at the hotel, I will not recommend anyone to stay at Keio Plaza Hotel Tokyo.